Finding a bowling club to host your next barefoot bowls party in Sydney can be difficult. Throughout New South Wales, there are numerous bowling clubs that offer barefoot bowls at their clubs. So save yourself the hassle of going to each of their websites and comparing bowling clubs. Compare the bowls clubs in Sydney right here, at Barefoot Bowls. 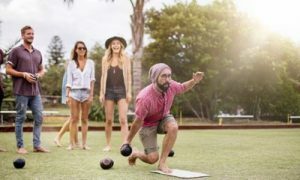 Simply follow this link and search by suburb to find the best barefoot bowls club for your event. We want to provide the online directory that that allows people to find the best bowling clubs for barefoot bowls in Sydney and New South Wales. With so many picturesque bowling clubs in Sydney and New South Wales, we understand that it can be hard to find the right one for you. We know that every event is different, whether it is for a birthday party, a bucks / hens party, or a corporate event with team building. Within each of the club pages here at Barefoot Bowls, you can compare the bowling clubs and enquire for pricing, catering, session times and more. Barefoot bowling events are fun, we know it all too well! Find your club today.